Do you plan to participate in a National Day of Prayer event Thursday? Coweta Superior Court Judge William F. Lee Jr.
Coweta’s Chief Superior Court Judge William F. Lee Jr. says he will retire as of May 1, a decision that comes amid an investigation by the state’s judicial watchdog agency. Stephanie Mayfield, Deal’s press secretary, said Friday that Lee’s resignation was accepted by Deal on Thursday. In a letter, the governor thanked Lee for “apprising me of your resignation” and thanking him “for the service you have rendered” as a judge. A report originating with the Judicial Qualifications Commission of Georgia noted “allegations of judicial misconduct” on Lee’s part. The document noted the matter “was concluded between Lee and the Commission ... with a mutually agreed upon disposition” that hinged on Lee’s retirement this coming Tuesday. Four Judicial Qualifications Commission cases alleged Lee improperly communicated and entered orders without notice to all parties and/or their attorneys and that he assigned cases to himself when he was disqualified because of judicial rules. Lee could not be reached for comment Friday. Lee will become the seventh chief Superior Court judge to step down from the bench since 2010 while under investigation for ethical lapses. A consent order filed with the Supreme Court of Georgia on Thursday afternoon formalized Lee’s retirement and the resolution of “any charges in the” matters before the Judicial Qualifications Commission. Lee and Jeffrey R. Davis, director of the commission, signed the consent order. 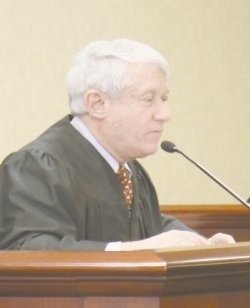 Lee, 69, said Thursday that he was retiring on his own terms after nearly 32 years as a judge. “I hereby announce that I will be retiring as judge of the Superior Court of the Coweta Judicial Circuit on May 1,” Lee said in a statement to The Newnan Times-Herald. Lee indicated that only a couple of weeks ago he was considering a run for re-election. His is one of two Superior Court seats up for re-election and qualifying is May 23-25. “While I realize that the retirement is somewhat sudden, I have been contemplating it for some time,” he said. “With qualifying for election to this position coming up, I had to decide whether to seek re-election or not. “I am 69 years old, have been a lawyer for almost 45 years, and have been Superior Court Judge for almost 32 years. It is now time to retire,” stated Lee, who was the Coweta Circuit district attorney for five and a half years before becoming a judge. Lee said he does not intend to take senior status. “I have no desire to serve as a senior judge and will not seek to do so. Nor do I have any desire to practice law. My only desire is to retire,” he said. Lee is chief Superior Court judge for the Coweta Judicial Circuit. His offices are in the Coweta County Justice Center on Greenville Street in Newnan. The Coweta circuit covers Coweta, Carroll, Heard, Meriwether and Troup counties. Lee’s post is one of five judgeships serving the circuit. Mayfield said the Judicial Nominations Commission is expected to prepare “a short list” of candidates to succeed Lee and to present that list to Deal. “Then the governor conducts interviews” with those nominees, she said. Mayfield said she was not certain of a timeframe for the naming of a successor to Lee. Has Newt Gingrich run his final race for elective office? Do DOT's guidelines sometimes get in way of improving traffic flow? © 2011 The Newnan Times-Herald Inc., Newnan, Georgia. Any unauthorized use, copying or mirroring is prohibited.